Longtime environmental activist Ruth Masters has dedicated her life to preserving nature. InFocus Magazine has been providing an in-depth look at the Comox Valley for over two and a half decades. InFocus is published 4 times a year: Spring, search Summer, Fall and Winter. The magazine is available free for pick up in the Comox Valley in drop boxes and at our advertisers’ establishments. InFocus is a team effort, bringing together writers, artists, photographers, poets, activists and pretty much anyone with an interesting point of view. InFocus Magazine is a fantastic way for businesses to reach a locally-involved and progressive audience both in print and online. 2006 was just another hot, dusty day in Afghanistan, but for one Comox Valley family, the events of that fateful day would be life changing. Corporal Andrew James Eykelenboom (‘Boomer’), a 23-year-old medic at the tail end of a brutal seven-month tour in Afghanistan, had volunteered to run one more mission outside the wire. During that fateful mission, a 17-year old Syrian boy with a head full of idealism and a truck full of explosives rammed the transport vehicle in which Andrew was sitting. Although his comrades escaped with their lives, Andrew’s was extinguished within the flames of the burning vehicle. He had been just weeks from returning home to the Comox Valley. While nothing can take away from the terrible tragedy of a life lost so young, a phoenix of sorts has arisen from the ashes of that burned-out transport truck. In honor of Andrew, her youngest of three boys, Maureen Eykelenboom has created an organization to assist the people of Afghanistan that her son had so desperately wanted to give a better life. Boomer’s Legacy, a registered charity run by Eykelenboom and a handful of friends, has raised thousands of dollars for assistance to Afghanistan and has touched the lives of innumerable people around the globe. At the heart of the operation are Eykelenboom’s selflessness and her steadfast commitment to giving the children of Afghanistan, and the world, a better future. Every week Eykelenboom and a few friends would pack a box full of items for Andrew to give away to the children of Afghanistan. It wasn’t until the shock of Andrew’s death, however, that the beginnings of something larger began to take shape. While Eykelenboom was in Trenton, Ontario for Andrew’s repatriation ceremony, two of her friends crafted the idea of producing ‘Boomer caps,’ tiny toques that could be placed on a newborn baby’s head to help the infant retain its body temperature. The caps could then be shipped to troubled parts of the globe where they could help newborn babies during their most vulnerable stage. The small team began sending emails out to their many contacts through the Soroptimist International Club, of which they were members, looking for people to knit the caps. Because Eykelenboom had just attended an international Soroptimist conference that summer, the contact list was extensive and spanned the globe. Today, the first floor of Eykelenboom’s Comox home has been transformed into a veritable distribution centre with hundreds of Boomer caps piled atop a barely visible pool table waiting to be shipped off and placed caringly on tiny, needy heads. Boomer’s Legacy has collected 53,000 caps to date, mostly from Vancouver Island but also from England, New Zealand and elsewhere. The caps are shipped all over the world via mission groups, military personnel and ICROSS, the International Community for Relief of Starvation and Suffering. While the Boomer cap operation took on a life of its own, Eykelenboom still wanted to do more, and she still wanted to help the people of Afghanistan specifically. Her initial plan was to develop a charity that would support education in the war-ravaged country, and her motivation was nothing short of altruistic. She eventually realized, however, that the Afghan people had much more basic needs to be addressed, such as health and security, before they could tackle the issue of education. That’s when she discovered the Assistance to Afghanistan Trust Fund (AATF), a fund administered by the Canadian Forces that supports material assistance programs in Afghanistan. Partly because the AATF is designed to enable Canadian soldiers on the ground to recommend how the funds are spent, Eykelenboom immediately realized that she had found the vehicle to facilitate her son’s vision. Although giving her organization’s money to the AATF wasn’t as easy as she had thought it would be, with a bit of perseverance and some friendly string-pulling from then-General Rick Hillier, Boomer’s Legacy became the first civilian organization to name the AATF, a military initiative, as an official donee. Complementary to its Boomer caps’ program, Boomer’s Legacy holds a variety of local fundraisers, such as last month’s gala event starring author Christie Blatchford, renowned local pianist Sarah Hagan and Lt.-Col. Ian Hope, Commanding battle Officer for the Canadian battle group in southern Afghanistan. To date, the organization has raised more than $125,000 to help pay for clean drinking water, food, medical care and even educational facilities and supplies in Afghanistan. As a corollary benefit, Eykelenboom hopes that the involvement of Canadian military personnel in distributing supplies will help make their difficult tours of duty a bit more bearable. It’s a cause, and a process, that Andrew would have believed in. Andrew Eykelenboom was 16 when his parents took early retirement and moved with him to the Comox Valley. Although he’d been a bit of a troublemaker as a young boy, he’d by then matured into the kind of son of which any mother would be proud, and the two shared a close, loving relationship. Some days Andrew would tease his mom by sneaking up on her and throwing her over his shoulders, refusing to let her down and playfully threatening his father that he’d be next if he came to her rescue. On other days he and his mother would race to the living room couch; the last one to get their feet up owed the other a foot massage. “We had a fantastic time together,” says Eykelenboom. Above all, however, she says her youngest son was a man of purpose. When Andrew was in Grade 12 he did some work experience at CFB Comox and decided to join the military. Although he initially wanted to enlist as a firefighter, he instead signed up as a medic and headed back to Edmonton to undergo his training with 1 Field Ambulance. Maureen Eykelenboom visited Afghanistan for the first time in July 2008 to present a cheque for $8,000 from Boomer’s Legacy. While she admits that the experience was “surreal,” she says that it reaffirmed her conviction that her organization and the efforts of her team are making a difference. While there are several ways to support Boomer’s Legacy, such as knitting Boomer caps or attending fundraisers, Eykelenboom stresses that it’s the greater cause of supporting our troops that needs support first and foremost. To learn more about Boomer’s Legacy, or for Boomer cap knitting patterns, visit www.boomerslegacy.ca. ugust 11, recipe 2006 was just another hot, dusty day in Afghanistan, but for one Comox Valley family, the events of that fateful day would be life changing. you’re interviewing Ruth Masters? I’ll bet that will be lots of fun. Just don’t expect it to go the way you’ve planned. “It’s not just that she’s old—80-something—so she might ramble. The main thing is, she’s a helluva strong personality. She doesn’t just live on Powerhouse Road, that’s what she is—a powerhouse,” warned a friend of mine cheerfully when I told her what I was working on. “This here—this land, preserving it—this is truly the height of my career,” says Ruth Masters of the 18-acre Masters Greenway and Wildlife Corridor. Yeah, yeah, I thought dismissively. My plan seemed failsafe. Masters is an environmentalist, so she’s bound to be a speechifier, I thought. With a few well-placed questions, she’ll launch into a vivid stream of environmental rhetoric. There’ll be the dire warnings, the damning statistics about climate change, habitat loss, pollution, etc., etc., and then, once we are suitably distraught, the call to action, the heartfelt plea to unite to save Mother Earth. This is going to be so inspiring, I think, as I pull into up to Masters’ modest cottage. With the material she gives me, I’ll have readers dabbing their eyes with unbleached organic cotton handkerchiefs as they pledge to dedicate their lives to the environment. Soon after, sitting with Masters at her weathered but sturdy picnic table, I realize my friend was right. Masters is not going to make an inspiring speech, no matter how much I nudge her in that direction. Regardless of how many times (and it’s a lot) she’s been described as a “legend,” an “icon” or a “major figure” of the BC environmental movement; regardless of the fact that she’s twice been named Comox Valley Citizen of the Year, she determinedly avoids the metaphorical soapbox I keep nudging in her direction with my journalist’s questions. In fact, she’d rather crack jokes. “If the whole thing sinks or blows, at least I’ll know I’ve tried,” she quips, with a laugh, pithily summing up both the motivations and rewards of her extraordinary career of protesting, blockading, letter-writing, and well-intentioned mischief-making, all in defense of the earth. And that career is far from over. The powerhouse on Powerhouse Road is still protesting, still making the news, and still a vigorous walker, now with the help of her trusty cane. “A few months ago I was standing out on the Dyke Road [beside the Comox Estuary], where they want to put a Gas ‘N Go service station, with a sign saying ‘No Gas Here—Go!” she says. “With the knowledge gained in the last 30 years about the care of estuaries, this should be prohibited.” The issue of the Gas ‘N Go is unresolved, and Masters will keep going back until it is. “I’m a tough old hen of 88, and I’m running for 100,” she says merrily—and convincingly. 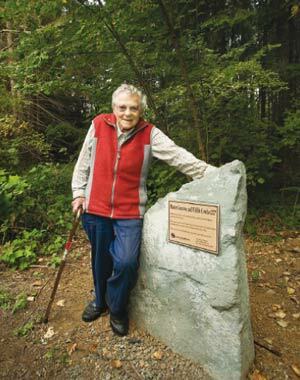 An avid hiker her whole life, Masters last “clawed her way” up the Comox Glacier in 1991, when she was 71. Although she cheerfully admits to being too old to make the climb again (it was her sixth ascent), she has no trouble at all escorting me on a 20-minute walk through the forest next door to her house, talking all the while—no rhetoric, but instead facts and anecdotes about the land we are on, land she clearly loves. This is one of the reasons I’m interviewing her—because of this 18-acre property, now called the Masters Greenway and Wildlife Corridor.